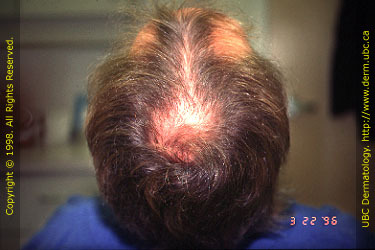 Most cases of hair loss are due to androgenetic alopecia (AGA). Fifty percent of men by age 50 years and 40% of women by menopause have some degree of AGA. 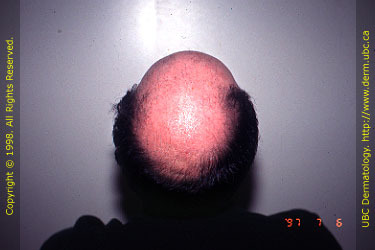 Hair loss is gradual, with miniaturization of genetically programmed hair follicles. Uptake, metabolism, and conversion of testosterone to dihydrotestosterone by 5-alpha-reductase is increased in balding hair follicles. AGA appears different in men as compared with women. 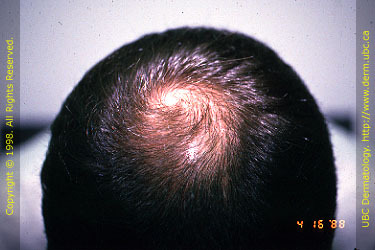 In men with AGA, hair loss occurs in the fronto-temporal regions and on the vertex of the scalp, depending on severity. In female AGA patients, it is more diffuse and located centroparietally. 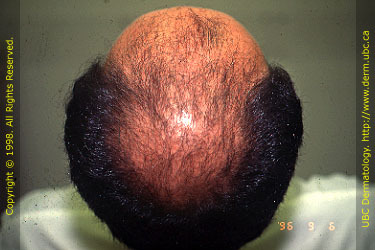 The frontal hairline is usually intact in women. Treatment is either medical or surgical. The only proven medications that are indicated for AGA are topical minoxidil (Rogaine®) and oral finasteride (Propecia®). Minoxidil's success for cosmetically acceptable regrowth is approximately 10% in men. 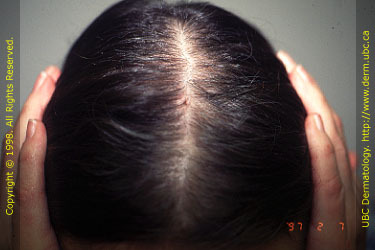 In women, 50% show minimal regrowth and 13% moderate regrowth. Treatment is lifelong. Seven percent of patients may experience some irritation (burning, itching, redness) from the minoxidil solution. The 5% minoxidil solution has greater efficacy than the 2% minoxidil solution (Rogaine®). 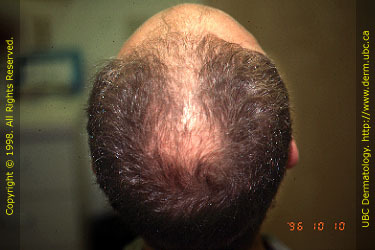 Finasteride recently has been shown to have significant efficacy in male AGA. Finasteride reversed hair loss in 66% of men and stabilized hair loss in 83% of men after two years of follow-up. In women, the use of a systemic antiandrogen such as spironolactone (Aldactone®) 50 to 200 mg per day, cyproterone acetate (Androcur®), or flutamide (Eulexin®) may have some benefit in reducing the amount of hair thinning. Finasteride in not indicated in women. Hair transplantation of permanent hairs from the back and sides of the scalp to balding areas in the front is a successful procedure but usually requires three to four sessions over 2 years to fill in an area with adequate density. The advent of mini- and micrografting has revolutionized hair transplantation into a more natural-looking process, eliminating clumping or tufting. Donor harvesting with strips rather than plugs has made the donor site more cosmetically acceptable. Hair transplantation is useful not only in men but also in women. AGA in a female. Shows widening of the part in the centro-parietal area. Stage IV. Note the emergence of a bridge. Stage V. Note the disintegration of the bridge. Stage VI. Bridge has disappeared. University of British Columbia Hair Research & Treatment Centre.